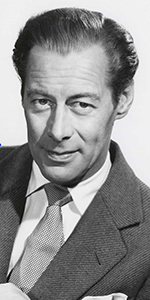 Rex Harrison was a commanding presence in the movies and on stage throughout a long career. Best known for creating the role of Henry Higgins in the musical My Fair Lady, Harrison typically played witty, impatient, irrascable, fascinating characters. Born into comfortable circumstances, Harrison suffered from the measles as a child, which cost him the sight in his left eye. Gravitating toward the stage, he made his debut at the age of 16 in Liverpool in 1924. Educated at the nearby Liverpool College, Harrison made his film debut in a soccer (footballing) comedy: The Great Game with John Batten (released in August, 1930), for Gamount-British, but he generally stuck to the stage, eventually attracting great notice by appearing in the West End production of French Without Tears in 1936. Noël Coward was impressed: "He is the best light comedy actor in the world — except for me." And comedy was were he was to remain, in Men Are Not Gods with Miriam Hopkins (released in November, 1936), School for Husbands with Diana Churchill (released in August, 1937), and others until he was able to get himself into a thriller: Night Train to Munich with Margaret Lockwood (released in August, 1940). With England in the war, Rex found time to star in a film of Shaw's Major Barbara with Wendy Hiller (released in August, 1941). Harrison served in Royal Air Force during World War II, becoming a Flight Lieutenant. 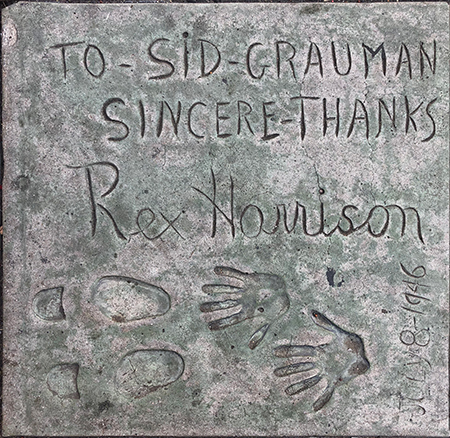 Still, Harrison answered the call to help fill the cinemas of the British Empire, starring in David Lean's film of Coward's Blithe Spirit with Constance Cummings (released in May, 1945), but after the war, he agreed to make a string of films for 20th Century-Fox, beginning with Anna and the King of Siam (whichpremiered at the Chinese in July, 1946), and for which he and his co-star Irene Dunne, were imprinted together at the same ceremony. The other films he did for Fox, The Ghost and Mrs. Muir with Gene Tierney (which played the Chinese in July, 1947), The Foxes of Harrow with Maureen O'Hara (played the Chinese in October, 1947), Escape with Peggy Cummins (played in July, 1948), and Unfaithfully Yours with Linda Darnell (played in December, 1948), made him very well-known to U.S. audiences. Harrison won a Tony Award for playing Henry VIII in Anne of the Thousand Days on Broadway at the Shubert Theatre in the 1948 season. He was then in the Broadway production of Bell, Book and Candle at the Ethel Barrymore Theare in 1950; he would have been in the film, but couldn't because of a scheduling problem. Harrison starred in the West End transfer of T.S. Eliot's The Cocktail Party in 1951. Then, a spate of films, like the mystery The Long Dark Hall with Lilli Palmer (released in February, 1951), or the comedy The Four Poster with Lilli Palmer (released in October, 1952), and even wide-screen spectacle: King Richard and the Crusaders (released in August, 1954, and where he played an Arab — the Emir Saladin opposite George Sanders' King Richard — wow), and Marriage a la Mode with Margaret Leighton (released in April, 1955). But then, it came: The role he was born to play: Harrison created the role of Henry Higgins with Julie Andrews as Eliza Doolittle in the musical My Fair Lady at the Mark Hellinger Theatre on Broadway in 1956, and remained with the show until late 1957. Easily winning another Tony Award for his performance, he and the show became a world-wide phenomenon. Somehow, he had to get back to filmmaking in order to make stuff like The Reluctant Debutant with Kay Kendall (released in August, 1958), and Midnight Lace with Doris Day (released in October, 1960, and The Happy Theives with Rita Hayworth, (released in January, 1962. And then there was that long, drawn-out journey to Italy to star as Julius Caesar in Cleopatra with Elizabeth Taylor (released in 1963). He's terrific in the first half of the film, but when he goes, he takes a lot with him. The big-budget films continued with the screen adaptation of his stage hit My Fair Lady with Audrey Hepburn as Eliza Doolittle (released in December, 1964, and for which, he would receive an Oscar for Best Actor), The Agony and the Ecstasy with Charlton Heston (released in October 1965), with Doctor Doolittle (released in December 1967) being his Waterloo; an expensive film which flopped at the box-office, Harrison expected to carry the film, but it didn't work out that way. Still very popular and commanding huge fees for films, Harrison starred in The Honey Pot with Susan Hayward (releaased in May, 1967) and Staircase with Richard Burton (released in 1969), which was a dud. During this time, he wrote his autobiography, simply called Rex, published in 1974. Turning to the stage once more, he reprised his role of Julius Caesar in a short revival of Shaw's Caesar and Cleopatra opposite Elizabeth Ashley at Broadway's Palace Theatre in 1977, then continued his essay of Shaw's plays by playing General Burgoyne in Shaw's The Devil's Desciple at the Ahmanson Theatre in Los Angeles in late 1977. He played Henry Higgins in a revival of My Fair Lady in 1981 at the Uris Theatre, toured the U.S. in it, then did his last film: A Time to Die with Rod Taylor (released in June 1983). Tony nominated for his role as Shotover in Shaw's Heartbreak House in the 1983-1984 season at the Circle in the Square Theatre (and which was recorded for television), Harrison starred with Claudette Colbert in a revival of Aren't We All? at the Haymarket Theatre in 1984, then took the show to a sold-out limited run on Broadway at the Brooks Atkinson Theatre in 1985. The now Sir Rex Harrison starred in a revival of The Admirable Crichton as Lord Loam at the Haymarket in 1989. Harrison became inpacted by poor health in his later years, along with a failing memory. He died of pancreatic cancer in June, 1990; his death brought the show he was appearing in, The Circle, to a close. He was 82. His second autobiography, A Damned Serious Business: My Life in Comedy was published in 1991. Grauman's Chinese Theatre, Hollywood, California. Rex Harrison Forecourt ceremony, Monday, July 8, 1946. Sid Grauman looks on as Irene Dunne helps steady Rex Harrison. 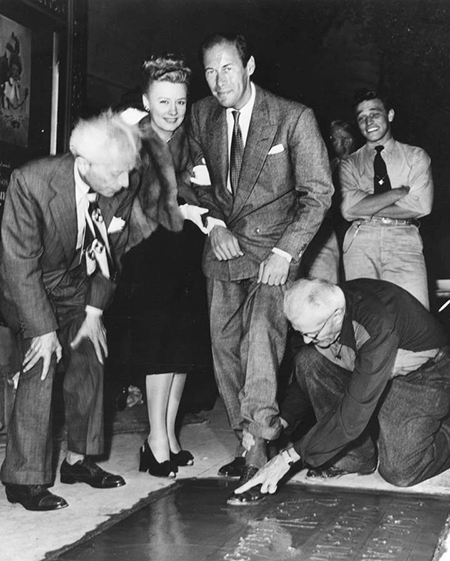 His shoe is being imprinted in the cement by cement artist Jean Klossner.